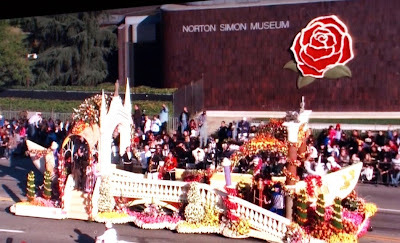 The Gondola Blog: A Gondola in the Rose Parade? 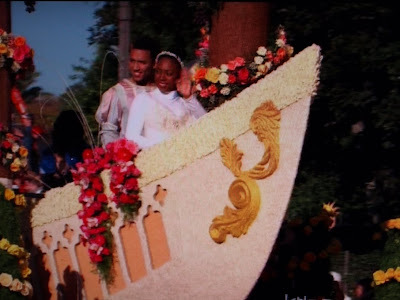 A while back I heard a rumor that the city of Long Beach, California would be entering a float in the Rose Parade, and that there was a gondola incorporated in the float design. I'm not sure how much it looks like a gondola. I think adding a ferro would have helped. 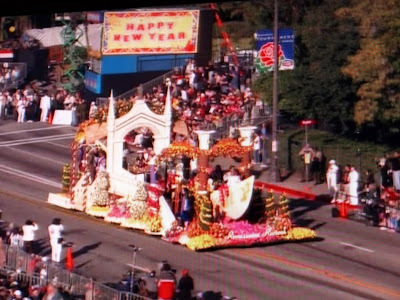 Among the many materials used to decorate the float, they used chrysanthemums and split peas. Apparently there was a gondolier from the operation in Alamitos Bay on the float. I didn't see anything but an arm in a striped shirt. Kudos to the guy who got to ride the float. Too bad we only saw his arm.